Firework Names. Where do They Come From. 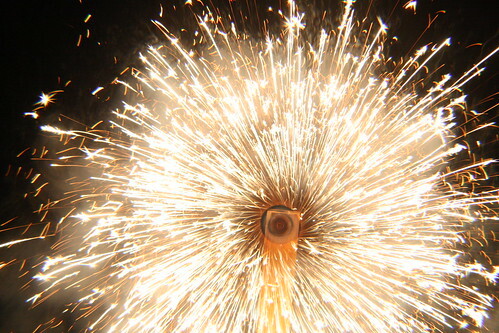 Why do we call fireworks by their names? The British have a wonderful tradition of calling fireworks all sorts of names, I’ll take you through a few of them. Catherine Wheel – Apparently named after St Catherine, who was executed by being tied to a wheel, and “broken” on it with hammers. Nasty – and it sounds so idyllic, too! Click here to learn more. Roman Candle – Oh, another rather gruesome one. Apparently, the Roman Emperor Nero used to set people on fire, and use them as “candles” at the arena. Whilst this is almost certainly a myth, it is curious – and in fact, not really accurate. A burning person doesn’t tend to set fireballs off up into the air! Squib – Old English slang for a failure, or a weak person – made very famous recently by Rowling in the Harry Potter series – but pre-dates her as a firework that fails to go off, often because it is damp! Pen-Lid cakes – An internet era name for effects – that resemble plastic pen lids being fired into the air! Click here to see some pen-lid cakes in action. Best of all – albeit a long-banned item, it’s the “Jumpin Jack”, named after the mythical (and perhaps very real) “Spring Heeled Jack” who terrorized London for a while, with his remarkable athletic ability! I like catherine wheels especially the big ones;they add a touch of sparkle to any good display and are exciting as well if they contain crackles and whistles on top of colour.